Use of dental motor hand piece and aerator hand piece is a very vital part of many dental treatments like cavity preparation access openings, tooth preparations for fpd ..etc. So every dentist must know the amount of pressure which has to be applied while using a aerator hand piece. As “Pressure is directly proportional to temperature or heat generated” and as we know the aerator rotates at a very high RPM. Pressure should be inversely proportional to RPM as RPM increases pressure applies should be decreased. Temperature should not exceed 110 degree Fareinheite. So we should keep in mind that High speed with low pressure using air and water as coolants is compulsory while using aerotar hand pieces. 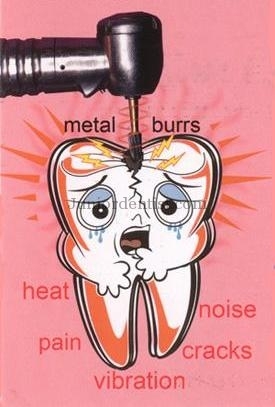 If there is no water supply to the Aerotar while drilling the Enamel or Dentin it can lead to Pulpal Necrosis because of the amount of heat being generated. As the Pulp is a soft tissue excess heat generated can lead to degeneration of the tissue which is irreversable. thanking you for shareing your precious knowledge. keep going.